On the content of Co in some Norwegian sulphide deposits. The content of Co in the Norwegian sulphidic ore deposits has recently been the object of increasing interest. 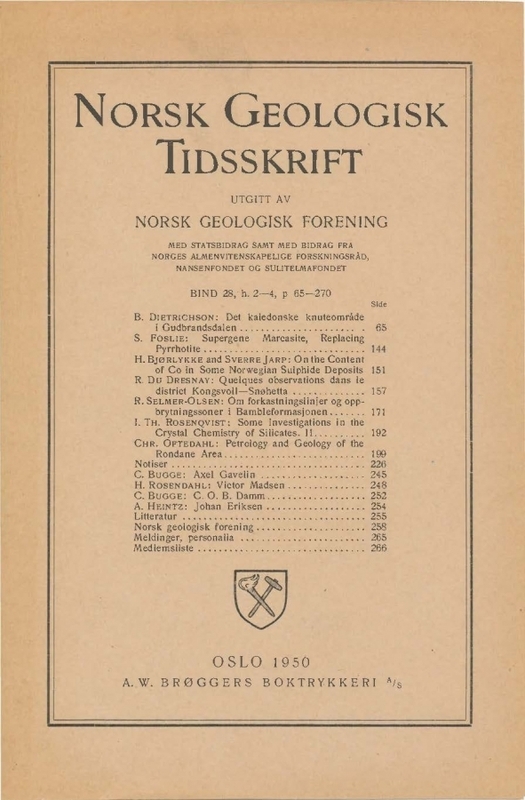 The purpose of the present work was by means of a new exact chemical analytical method to get exact data of the Co content of different types of Norwegian sulphide ores. Some chemical analyses of the content of Co of these ores have previusly been published by J. H. L. Vogt (14) and S. Foslie (10). Several optic spectrographic and X-ray spectrographic determinations have also been published by C. W. Carstens ( 4, 5, 6) and H. Bjørlykke (2, 3).